Finding the perfect dress is a bit like finding the One: you just know. Styling your wedding dress perfectly involves creativity. Sometimes, you wish it had a little bit more something. More lace, more bling, different straps. 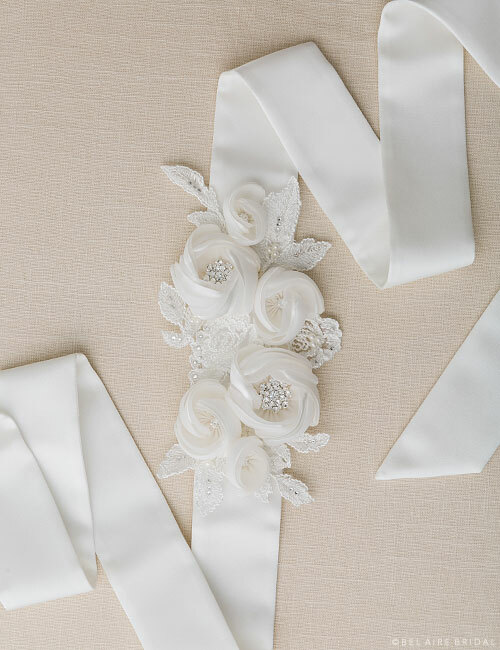 One easy way to transform a design into your dream gown is by adding a bridal sash! Our lovely belts may be sewn directly onto the dress or tied in the back. This elegant accessory adds sparkle, waist definition, beauty, and originality to your overall look. Check out our top six picks for the upcoming wedding season! Nothing says romance like flowers. Style a gorgeous, unforgettable bridal look with lavish fabric peony flowers featuring sparkling rhinestone centers. A touch of Alençon lace adds feminine flourish to this lovely design. This sash ties in the back on wide satin ties. One size fits most. You might like My Bridal Style: Romantic. Check out the matching peony hair clip 6435. Add vintage-inspired sparkle to your waistline. Silver embroidered swirls and dazzling rhinestones create an eye-catching, elegant accent fit for a princess. This design ties in the back on folded organza ribbon ties. One size fits most. You might like My Bridal Style: Vintage. Add a swirling rhinestone headband like 6688. 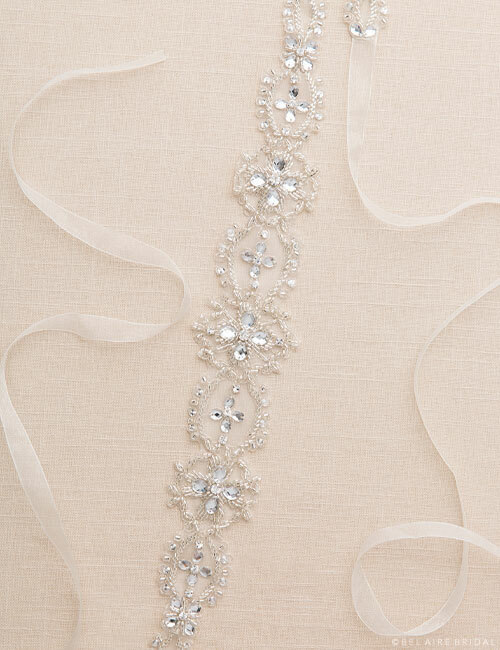 Bedazzle your bridal gown with a sparkling organza sash. Intricate silver beading and small round rhinestones on a cut out pattern of embellished ovals melt into the background of your dress with sheer beauty. This design ties in the back on organza ribbons. One size fits most. You might like My Bridal Style: Trendy. Add a delicately wired, sparkly hair vine like 6657. Check out our Belts page or follow us on Instagram for styling updates!